Last winter when I was visiting relatives in Shanghai, which you can read about here, it was December and therefore chilly weather was a daily occurrence. Shanghai is beautiful and the winter's there are no different, therefore after a day of exploring outside, we were ready to come home to the comfort of a warm apartment. 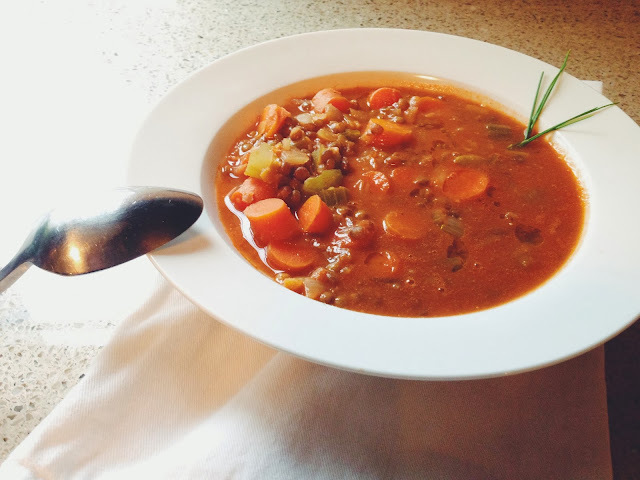 We were then introduced to the Barefoot Contessa's French Lentil Soup and after tasting this soup I came to the conclusion that I really did enjoy soup. I've always been more of a fan of cream based soups but after trying this soup, I have converted to being a tomato-based soup fan. Not only is this soup extremely easy, hearty and healthy, it is completely vegan friendly and gluten-free because we replaced the chicken broth with miso broth.